We are not particularly into printing press releases from PR companies just for the sake of it but at least they do put the business back into your mind and so it was over the weekend with the bog standard stuff about a golf course receiving a new award and being placed higher on some golf course listing or another. We have become cynical about tourism awards in general as you can't move for yet another version of hotel/attraction/course of the year for here there and everywhere. World banqueting business would drop by about 20% if it wasn't for the number of Annual Tourism Awards Ceremonies the industry holds! 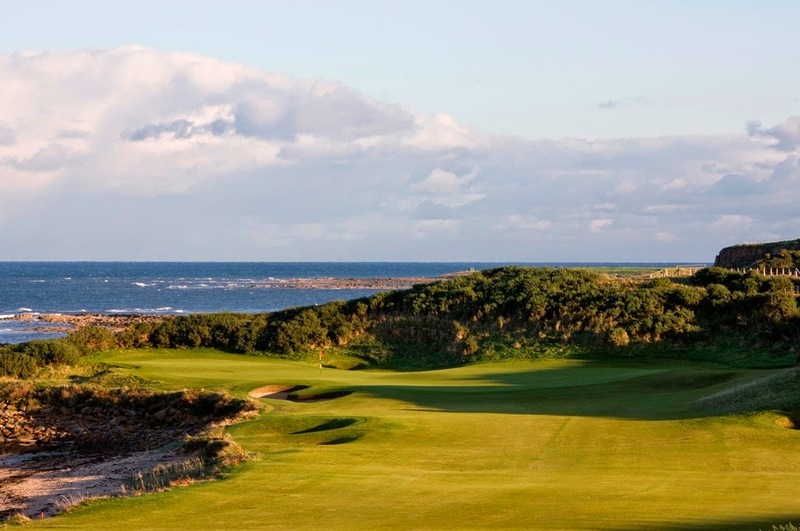 Anyhow according to the release Kingsbarns Golf Links has finished the 2014 season on a high with special recognition at Scotland’s golf Oscars and a prominent showing in the latest edition of one of the UK’s most respected course rankings. The Fife course rounded off the year by picking up the top award at the Scottish Golf Tourism Awards and climbing up Golf Monthly’s top 100 UK & Ireland golf courses list for 2015/16. Located near St Andrews, the links course has been one of the most discussed venues in Scottish golf tourism terms for more than a decade and for many was responsible for shifting some of the more dated service attitudes of the older Open Championship courses. It has benefited most certainly from being the close neighbour of The Old Course and world wide media and celebrity endorsement after co-hosting the Alfred Dunhill Links Championship for more than ten years. It is now scheduled to host the Ricoh Women’s British Open in 2017. Discarding the awards for a second, the course really does deserve a mention. We haven't been operating as golf tour operators for some time but when we hosted our series of Drambuie Golf Classics around Scotland, Kingsbarns invariably came out with the best feedback. The course got the mix right way back at the start and the management team recognised that the quality of the course could be complemented with quiet efficiency rather than out and out ostentatiousness. The welcome was always informal and very Scottish; the clubhouse surroundings comfortable and relaxing with no unnecessary formality; the staff local and lacking pretension. Okay this was a couple of years back and we worry a little that the course now has a Chief Executive rather than a simple manager but what's in a title! The cost has risen quite substantially over the years but we are sure that it is still in safe hands under the watchful eye of Art Dunkley, director of Kingsbarns Golf Links whom I had the good fortune to meet during one of our events. If you're planning a golf trip to Scotland Kingsbarns should be one for your list. Not cheap but rewarding.